Dow leader Boeing jumped 5%, set for a new all time high with a market cap north of $200 billion, after reporting earnings that blew away expectations, bolstered by surging deliveries of the 737, the planemaker’s biggest profit-center, and an unexpectedly large one-time gain from U.S. tax cuts. The company reported adjusted Q4 earnings of $4.80 a share, or $3.06 a share excluding the tax gain; both numbers were comfortably above the $2.90 consensus estimate. Revenue for the aircraft maker rose 8.9% to $25.4 billion, also beating the $24.7 billion analyst estimate. The company announced a $1.74 per share benefit in Q4 from the lower corporate levy and said it expects more benefits to come this year. In more good news, the tax reduction is taking effect just as the company starts to see large, taxable cash gains from its 787 Dreamliner after a decade of losses. Just this January Boeing had already surged 15%, the largest gain among the 30 members of the Dow Jones Industrial Average and the biggest contributor to the index's YTD gains. The stock has more than doubled since the start of 2017 as Boeing surpassed General Electric Co. to become the largest U.S. industrial company by market value, according to Bloomberg. Meanwhile, the futures remains bright: in addition to its humming military business, lower taxes are combining with record jetliner deliveries to fuel the cash gush at Boeing, the biggest gainer on the Dow Jones Industrial Average last year and so far in 2018. Free cash flow was $2.47 billion in the fourth quarter, Boeing said in an earnings report Wednesday, exceeding the $1.66 billion expected. “The buyback and cash flow have been the whole story on the stock for the last year,” Ken Herbert, an analyst at Canaccord Genuity, said in an interview prior to earnings. And speaking of buybacks, Boeing has promised to return the equivalent of its free cash flow to investors through an $18 billion share buyback program and 20 percent dividend increase approved by directors in December. There has been bad news along the way too, but it was largely ignored: for one, revenue has declined since 2015. Boeing slowed deliveries of its highly profitable 777 jetliners as sales waned amid a shift to a new model, but EPS have continued to rise, largely boosted by buybacks which resulted in a 15% drop in the company’s average share count. Under Chief Executive Officer Dennis Muilenburg, Boeing has rolled out new planes like the 737 Max and 787-10 with few glitches while rival Airbus SEbattled engine delays for its A320neo and A330neo. Muilenburg’s campaign to make Boeing leaner has lowered the cost of goods and services. The planemaker is forecasting sales growth in 2018 as Boeing lifts 737 output by 11% and pockets additional tax savings. Revenue will range from $96 billion to $98 billion, the company predicted, compared with the $93.6 billion expected by analysts. 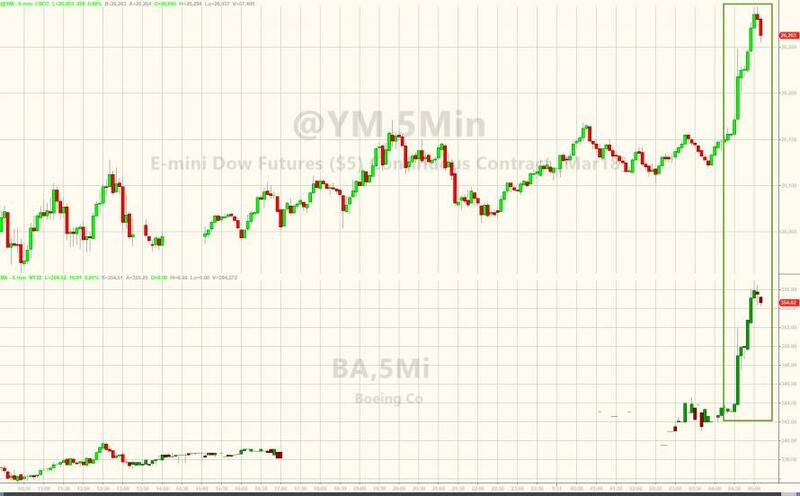 Most importantly, Boeing's premarket surge has sent Dow Jones futures over 210 points higher, which may be all this market needed to BTFD.